When Doug and I lived in St. Petersburg, FL, there was a restaurant downtown called Ceviche, which was named for the dish which we had never tried. If you are unfamiliar, ceviche is typically made from fresh raw fish marinated in citrus juices such as lemon or lime. It sounded a little “fishy” to us, but being the savory hacker adventurers we are, we decided to give it a try—and loved it! It’s summer, and avocados are plentiful! 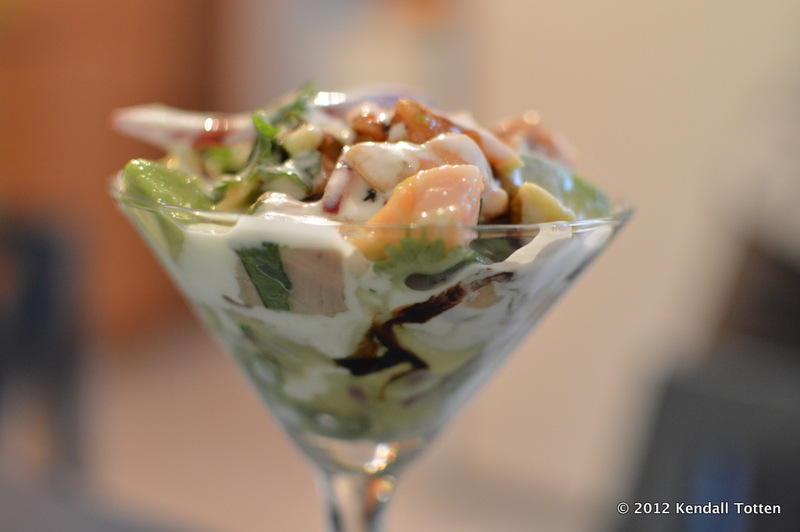 Why not add it to salmon ceviche? 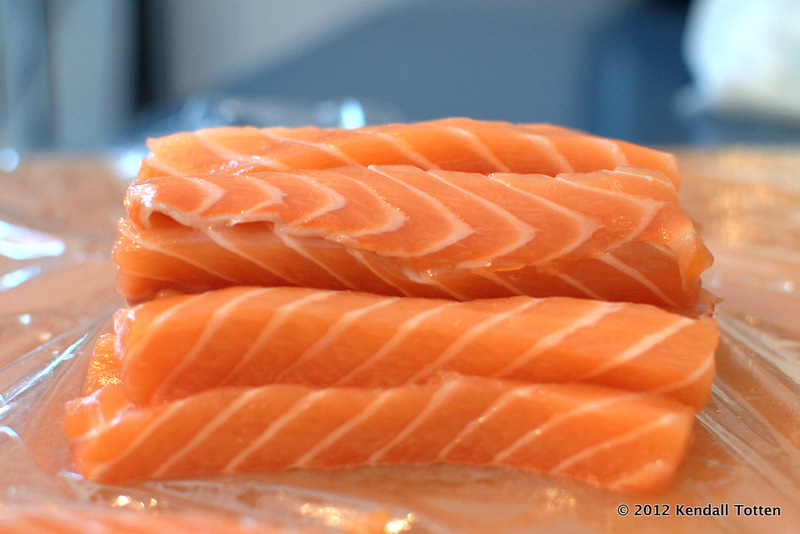 I just love the pattern of Salmon, don’t you? You’ll need about 1/4lb of salmon per person, and a 1/3 cup of lime juice (about 4-6 limes, depending on size). You need enough juice to submerge all the salmon cubes. 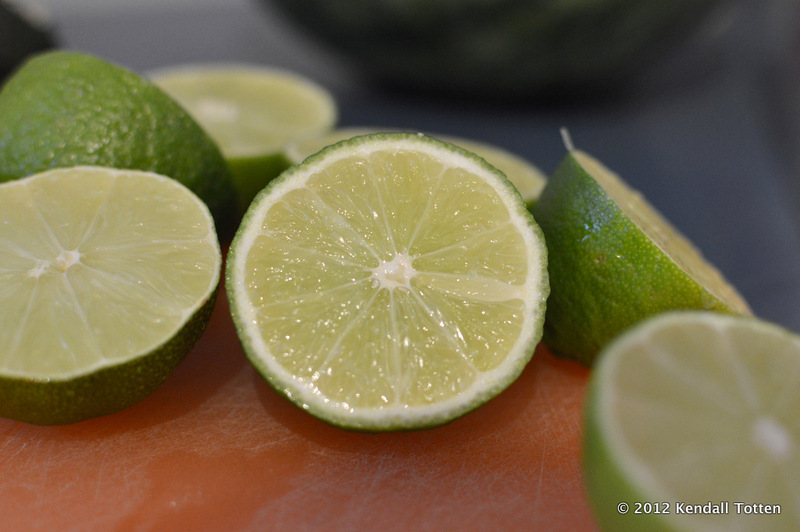 Limes are my favorite flavor of the summer. Cut up 1/4 cup of red onion slices, and 1/4 cup cilantro, 1/4 tsp sugar, and 2 1/2 tbsp sea salt. Let the salmon soaking in this mixture for 1-2 hours. How long you let it soak varies from one recipe to another, but if you’re using sushi-grade fish then you are safe, because you could just as soon eat it raw and be just fine. While you wait, whip up this easy and refreshing melon salad. 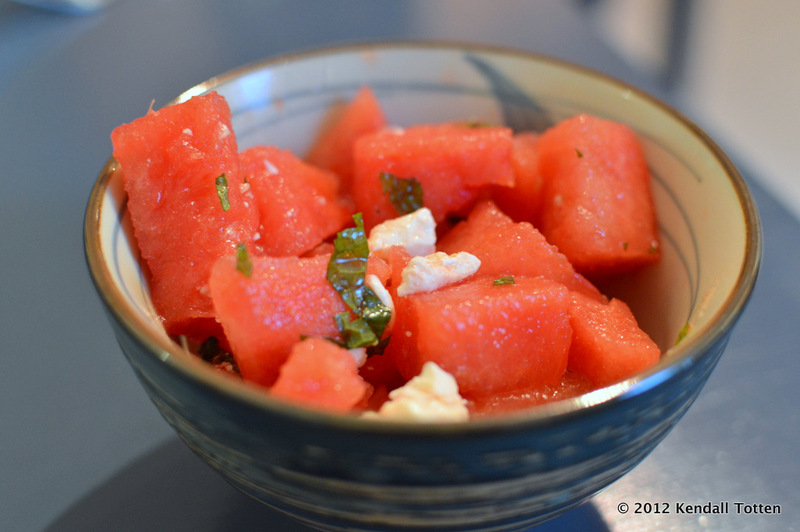 Just cube some watermelon, toss in feta crumbles, chopped mint, and a tablespoon of olive oil. I wish I had gotten a better shot of it, but it looked so good I didn’t want to wait to eat it! This might sound wacky, but its so refreshing and delicious! 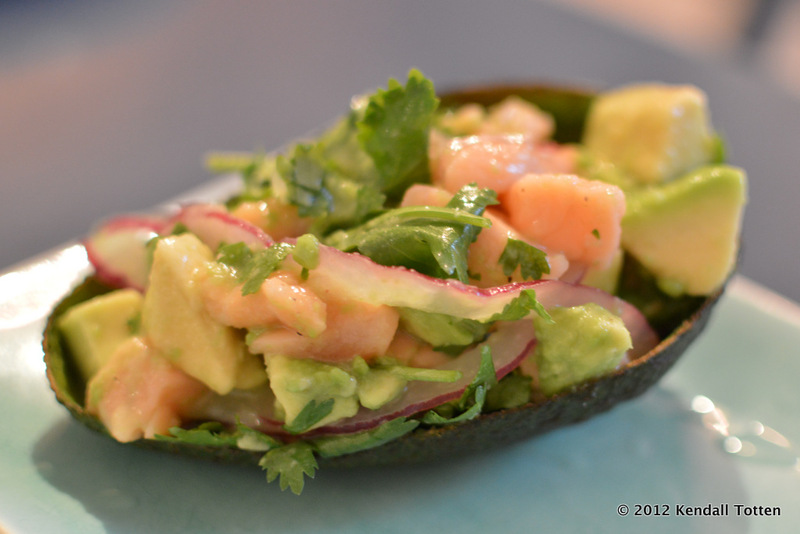 When the ceviche is ready, drain the excess liquid from the salmon and gently stir in the avocado slices. Allow to rest at room temperature for 15 minutes and then either serve it up in an avocado shell as shown above, or in a martini glass. This had a particularly nice effect when Doug drizzled the balsamic over it. Light, healthy, and gorgeous too. Oh, and did we mention tasty? 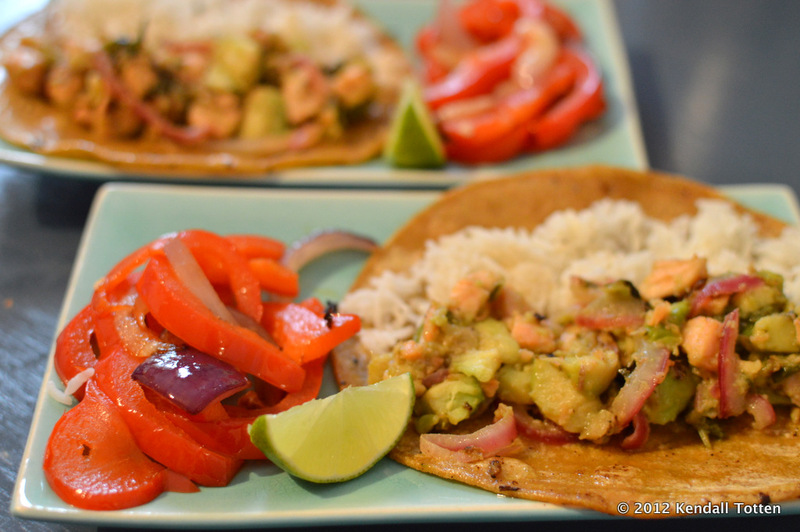 Lastly, if you happen to wind up with leftovers, you can toss it in the frying pan the next day and make some quick & easy fish tacos. These were really too good to be called “leftovers”! Fry up some red peppers and onions too if you prefer a fajita style taco.